Long Beach Transit’s zero-emission bus initiative will take longer than expected as two major issues—bus weight and cracks in the bus structure—bring new challenges in the procurement of ten electric buses from Chinese-owned company BYD. 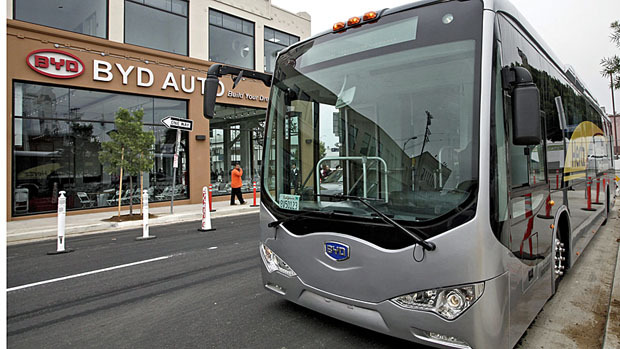 At Monday’s LBT board meeting, Long Beach’s Chief Traffic Engineer David Roseman expressed concern over the excessive weight of the BYD-purchased buses, ultimately showing that it would take a toll on streets and increase costs necessary to maintain them. Transit officials were forthright in admitting they knew of the weight issue before choosing to award BYD the contract. Rolando Cruz, Executive Director and Vice President of Maintenance and Facilities at Long Beach Transit, also updated the board Monday on BYD’s progress in having their buses tested at Altoona, the federal facility which oversees and tests the efficiency and structural soundness of public transit vehicles. According to Cruz’s presentation, the coach that is being tested—which comes from a BYD facility in China, not its now-open Lancaster facility that is due to create the LBT fleet—completed six of the 17 required tasks as of July 12 before visible cracks began to show above the rear door. Though it had only completed around 2600 miles worth of tests, BYD then pulled the bus and determined that the cracks were due to poor welding, asserting the issue was not related to a design flaw. After the BYD bus left Altoona, LBT pushed the anticipated completion date back, saying they would now rather have the Lancaster-built BYD bus go through Altoona testing as well before making the full purchase of ten buses. The initial completion date listed in the RFP was set for January 24 of 2014; it was then moved to May 18 of 2014 to allow for Altoona testing of the Chinese-made BYD buses. It now sits at January 15 of 2015. Once the current China-built bus completes Altoona, LBT will procure one of the ten buses; once the Lancaster bus completes testing, LBT will procure the other nine. These issues add further controversy to LBT’s decision to purchase cheaper buses from a Chinese-owned firm that at the time did not have a fully operational American construction facility. To address the issues occurring within the electric bus project and BYD, Chair Sullivan George on Monday requested the creation of an ad hoc committee—which included Roseman—to oversee the project. This committee will be separate from the already existing Alternative Fuel Committee.